[Fred:] Who can be the boss? Where the f**k you at? [Method Man] Shut the f**k up! [Method Man:] What's that, I didn't hear you? 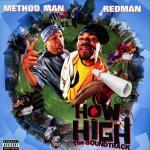 [Method Man] So shut the f**k up! You guys feel it out there?